MODA INTERIORS and BMW are taking their exciting pop-up design concept, LIVING MOVEMENT onto the road. 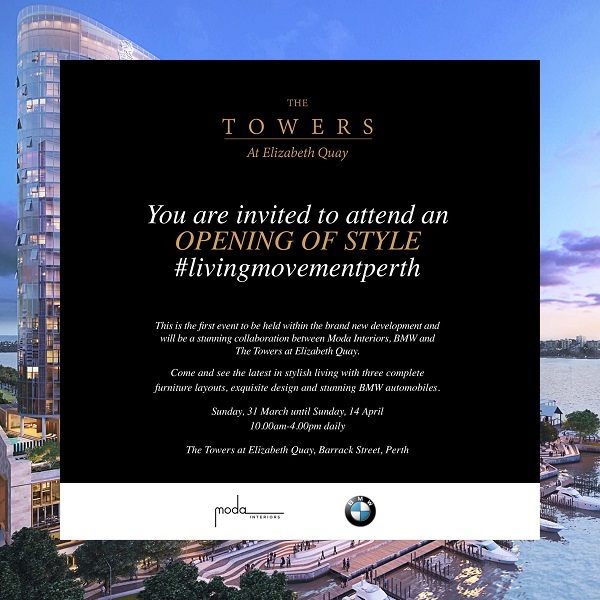 They have facilitated an exclusive opportunity to be the first to host a pop-up function and design exhibition at the prestigious The Towers and Ritz Carlton developments at Perth’s Elizabeth Quay. This exciting event will be the first opportunity that the public and VIP invitees will get to see the brand-new development in all its splendour at Elizabeth Quay. Following on from the success of the 2018 LIVING MOVEMENT event held at BMW Auto Classic, the 2019 LIVING MOVEMENT pop-up will showcase a range of exquisite design elements, including the latest in stylish living with three complete furniture layouts, stunning BMW automobiles and of course the latest in luxury apartments. This is the first event to be held within the brand new development and BMW, Moda Interiors, PRD Nationwide and the Far East Consortium are excited to showcase this event to the public. Since 2015, Moda Interiors have been recipients of Best Of Houzz awards year on year. 2019 has been no different with 2 awards granted. Moda Interiors created a whole new vibe for Auto Classic BMW in a collaboration showcasing a unique design installation in a first for Australasia. To wallpaper, or not to wallpaper? An age old question (or rather, a scaffold for a question) that we at Moda Interiors speak about a lot with clients. © 2019 Moda Designs. All rights reserved.